“Criminal Minds” actress A.J. 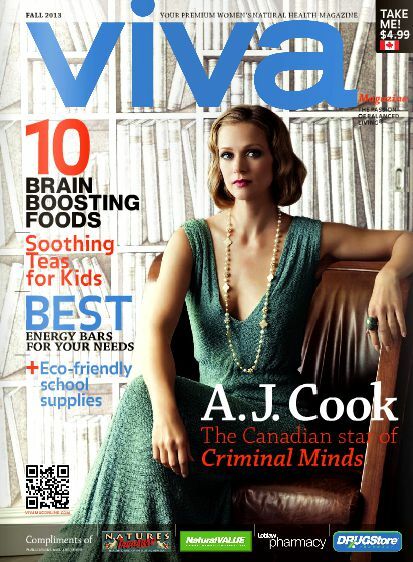 Cook is on the 2013 Fall issue of VIVA Magazine. The actress spoke about her school years, her life-style and more. Read the interview below. Cook’s mom also has poor eyesight, as does her older brother. “But I was by far, the worst” says Cook. The actor was required to wear special contacts or thick glasses. Growing up, dance recitals and performances kept Cook engaged because she didn’t have to recite or read anything. “I just didn’t want to become involved in anything at school,” she recalls. “The worst moment for me was in second grade right after getting those glasses. [I was] new to the school and I didn’t know anyone. There was a buddy reading program where the older kids would come and choose their younger partner. I was always the last to be picked; it gave me so much anxiety every time that I get sweaty palms just thinking about it all over again." It wasn’t until Cook turned 16 that she started to focus on acting. A year later she landed her first major role in "The Virgin Suicides”. Since then, she has appeared in over a dozen films and TV shows, but it wasn’t until she was cast as Supervisory Special Agent Jennifer “JJ” Jareau on TV’s hit drama “Criminal Minds” that she truly felt she had made it. Concerns about self-esteem and self-image no longer plague Cook who says motherhood has empowered her as a woman and given her the self-confidence that nothing else could. “Having my son was a complete game changer”, says Cook speaking of her five-year-old son Mekhai. “You have to grow up really quickly and there isn’t time not to have confidence. All of a sudden you’re forced to find the answers you never really bothered to find out before because now you have a little one you need to teach. You need to figure out who you are or else how is your child going to find out who he is?" Cook is as passionate about her unhealthy habits as she is about her healthy choices. Salt and vinegar Kettle Chips are her absolute favorite. “They’re crunchy and sooooo delicious…I’m trying to keep those down to a minimum.” Being Canadian, she holds a soft spot for Tim Hortons. “I love those little donut holes. It’s probably a good thing I don’t live there anymore because I’d be eating way too many Timbits." When Cook’s not stretching, working, or taking care of her family, you can find her making a trail mix of nuts, dried cranberries and dark chocolate bits and heading for the beach. "We’re an on-the-go family so keeping this trail mix in a zip lock is something that will keep our energy up for the day.” The former vegan also keeps fresh fruits and vegetables ready in her beachside kitchen so that smoothies and protein shakes are regular (and simple) snacks. At the end of the day, Cook relishes a worm bubble bath filled with lavender oil. “It helps me settle down before bed.” Cook also likes peppermint or spearmint oils which are on the opposite of the spectrum. “I do those baths for energizing and invigorating. I’m a big bubble bath person." Her strategy to achieve overall balance seems to be working. The self-described "natural, calm and comfortable woman” who culminates life with a healthy mix of activity, organic eating, me-time and work says: “I think appreciating where I am right now in my life truly gives me a sense of peace. A lot of times I don’t take those moments of appreciation, but just sitting at the beach and looking out at the water brings a sense of calm to me."